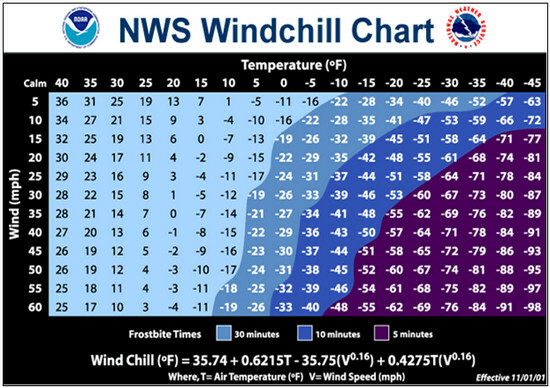 Wind chill is a life threatening weather danger that is often ignored or underestimated. Winter weather can not only be trying on the mind and soul, it also presents very real dangers to the human body. Extreme wind chills can be deadly and bring on the outset of frostbite and hypothermia. 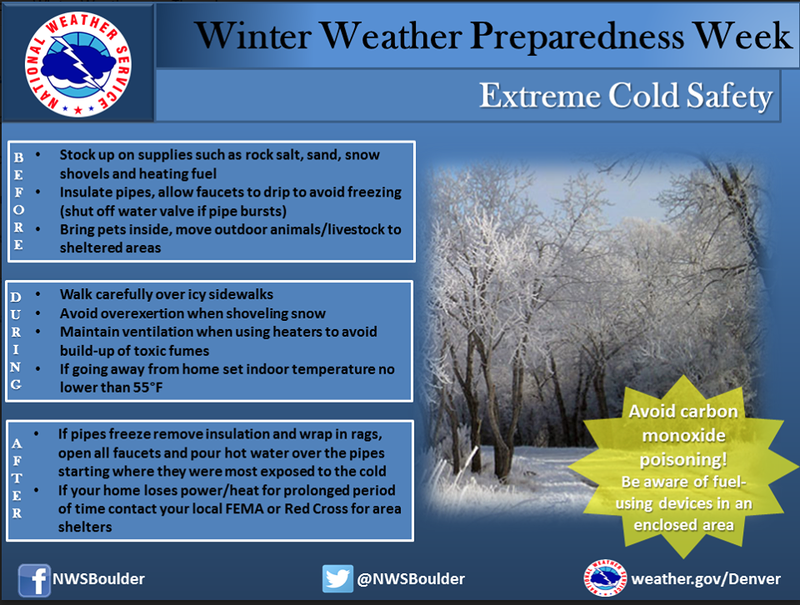 Here in Colorado, all residents should be aware of these hazards and be prepared to deal with them. 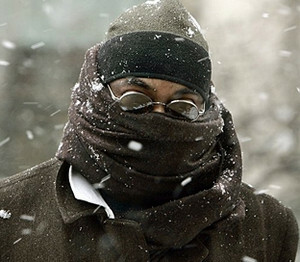 In this fourth in a series on Winter Weather Preparedness from the National Weather Service, ThorntonWeather.com helps you understand wind chill and how to protect yourself from frostbite and hypothermia. Extremely cold air comes every winter in at least part of the country and affects millions of people across the United States. The arctic air, combined with brisk winds, can lead to dangerously cold wind chill values. The Wind Chill Index helps you determine when dangerous conditions develop that could lead to frostbite or hypothermia. It takes into account heat loss from the human body to its surroundings during cold and windy weather. The calculation utilizes wind speed in miles per hour and temperature in degrees Fahrenheit. For example, a temperature of minus 5 degrees occurring with a 20 mph wind gives a wind chill near minus 30 degrees. This means that your body will lose heat at the same rate as it would if the air temperature were minus 30 degrees with no wind. Wind Chill values near minus 25 degrees mean that frostbite is possible within 15 minutes. How does the wind affect wind chill? See the chart below. Frostbite is the freezing of skin and the body tissue just beneath it. It first affects exposed body tissue where blood circulation may be limited such as your fingers, toes, nose and ears. To minimize frostbite, make sure all body parts are well covered. When frostbite starts, feeling is lost in the affected area and the frozen tissue will take on a white or pale appearance. If you suspect you are experiencing frostbite, hold the frostbitten area closely against warm skin to return blood flow and warmth to the affected area. Hypothermia is a dangerously low body temperature and is the most common winter weather killer. When you hear of a hiker, climber, hunter or a stranded traveler perishing from cold weather exposure, hypothermia was the cause. Most people are surprised to learn that hypothermia deaths can occur with temperatures between 30 and 50 degrees. If you or your clothing are wet, then hypothermia becomes even more likely. 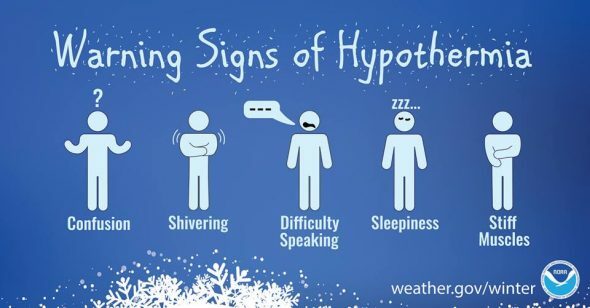 Warning signs of hypothermia include uncontrollable shivering, memory loss, disorientation, slurred speech and drowsiness. Immediate medical attention should be given to victims suspected of suffering from hypothermia. If no help is available, the victim should be warmed slowly with warm liquids along with dry clothing and blankets. The National Weather Service will issue wind chill advisories and warnings when a deadly combination of wind and cold air threaten. To learn more about wind chill, visit the national weather service internet site using lower case letters: http://weather.gov/om/windchill. Stay dry, wet clothing results in much faster heat loss from your body. Wear waterproof insulated boots. Stay covered, wear mittens or gloves and wear a hat. At least half of your body heat is lost if your head is not covered. Dress layered, trapped air between loose fitting clothing helps to insulate. Stay informed, have a portable NOAA weather radio nearby to keep you up-to-date with the latest forecasts and warnings. Use wind chill temperatures to guide you in dressing properly for the outdoors. On very cold days, minimize your exposure to the outdoors if possible. This entry was posted on Thursday, October 18th, 2018 at 4:59am MDT and is filed under Weather Education. You can follow any responses to this entry through the RSS 2.0 feed. You can skip to the end and leave a response. Pinging is currently not allowed. You have provided very interesting information. I have read a lot about wind chill. I like to share that wind chill has not official definition, right? In the UK, a system called the Joint Action Group for Temp Indices is used to realistically measure wind chill. This calculates wind chill by measuring how much heat is lost from a person’s bare face at a walking speed of 3mph. Even more the chart you have provided is the information I was in search. I have tried online wind chill calculator of AshBox, too. All in all nice information. Thank You for sharing.